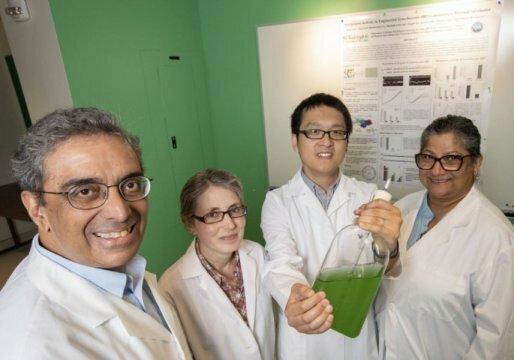 Himadri Pakrasi (left), led a team of researchers that has created a bacteria that uses photosynthesis to create oxygen during the day, and at night, uses nitrogen to create chlorophyll for photosynthesis. The team included Michelle Liberton (second from left), Deng Liu and Maitrayee Bhattacharyya-Pakrasi. Phthalates -- chemicals used in plastics belonging to the same class as Bisphenol A (BPA) -- can potentially interfere with hormones important for the developing brain. The research, led by Himadri Pakrasi, the Glassberg-Greensfelder Distinguished University Professor in the Department of Biology in Arts & Sciences and director of the International Center for Energy, Environment and Sustainability (InCEES); and Maitrayee Bhattacharyya-Pakrasi, senior research associate in biology, was published in the May/June issue of mBio..
As the mPFC is crucial for high level cognitive functions and reduced cognitive flexibility is observed in developmental disorders such as autism, the research shows how early life phthalate exposure can affect the brain and behavior. Creating fertilizer is energy intensive, and the process produces greenhouse gases that are a major driver of climate change. And it's inefficient. Fertilizing is a delivery system for nitrogen, which plants use to create chlorophyll for photosynthesis, but less than 40 percent of the nitrogen in commercial fertilizer makes it to the plant.